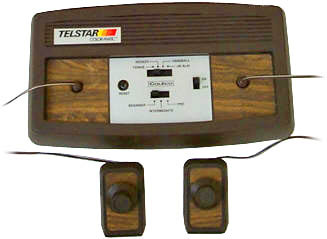 This unit was essentially the same as the Telstar Alpha, with a designed woodgrain finish. However it has the distinction of being the first Coleco unit with detached controllers and color graphics (box says "different color for each game"). The controllers are nice and small with long cords. They are connected to the unit through standard RCA plugs. This unit allows 4 games (Tennis, Hockey, Handball and Jai-Alai). There's a 3 positions switch that controls difficulty (beginner : slow ball, big paddles / advanced : fast ball, big paddles / expert : fast ball, small paddles). If this is common to the first Telstars, this is quite different from most of the other pong systems which offer individual settings. see more Coleco Telstar Colormatic - Model #6130 Ebay auctions !